We think these dividend stocks can continue growing their payouts for a very, very long time. While the official definition of Dividend Aristocrat is a company that has increased its dividend for 25 consecutive years, we're more interested in finding those that can grow their payouts for the next two and a half decades, and then some. That's because companies that consistently increase their dividends have proven to be winners over the long term. With that in mind, three companies that not only have long histories giving their investors annual raises, but also the ability to keep doing so for years to come are McCormick & Company (NYSE:MKC), ExxonMobil (NYSE:XOM), and Microsoft (NASDAQ:MSFT). That's why these Motley Fool contributors think they're great Dividend Aristocrats to buy with the intention of never selling. Matt DiLallo (McCormick & Company): Spice maker McCormick has been a great income stock over the years. The company has not only paid dividends to its shareholders since 1925, but it has given them a raise in each of the last 33 years, making it a true Dividend Aristocrat. What's more, these haven't been token increases to keep its streak alive, as the company's latest raise was 9.6% while the payout has doubled since 2011. Investors should expect more of the same from McCormick in the decades ahead. For starters, the company is growing at a brisk pace, with sales expected to rise 12% to 14% in 2018 while adjusted earnings should expand 16% to 17%. Driving that growth is the company's ability to develop and acquire the right products to satiate its customers' hunger for flavor. The company has done an excellent job over the years building its product portfolio to not only continue serving up iconic flavors, but to also mix up new ones. In addition to that ability to adapt, McCormick has a sound financial profile, including a solid investment-grade balance sheet and a low dividend payout ratio of less than 50% of its earnings. Because of that, it has the financial resources to continue expanding, which will drive future dividend growth. Overall, the company aims to increase sales by 4% to 6% per year over the long term, which should drive 9% to 11% annual earnings growth. That combination of financial strength and growth is the recipe used by the best dividend growth stocks and why McCormick is a great one to hold for the long haul. Check out the latest McCormick & Company earnings call transcript. Todd Campbell (ExxonMobil): When you're talking about commodity companies like ExxonMobil, forever is a long, long time. After all, there's only so much oil and natural gas in the ground. Nevertheless, I think ExxonMobil could be a great addition to forever portfolios. The company's share price has fallen remarkably in the past year as U.S. shale production has increased and oil prices have fallen. Worries of global unrest and slowing economic growth could reduce energy demand in the short term, but long term, global appetite for energy should continue climbing as emerging markets grow wealthier. Every year, ExxonMobil analyzes the latest trends and data to inform its long-range decisions, and its latest look stretches out to 2040. By its estimates, energy demand will increase 25% between now and then, despite increased efficiencies, and while the mix of sources of energy may tilt toward renewables, ExxonMobil should profit because oil and gas are expected to remain the largest sources of energy in the period. The company's upstream discoveries, including offshore Guyana and Brazil, add billions of barrels of oil equivalent that can drive earnings higher through 2025. And downstream investments that tilt toward refining higher-margin liquids and chemicals are similarly expected to drive earnings growth in the coming years. Since ExxonMobil has a long history of dividend increases, including a 6.5% increase last year, it produces mountains of cash flow, and it has the financial flexibility to react to changing energy demands. I think it's a good fit for any income investor, regardless of their time frame. Check out the latest ExxonMobil earnings call transcript. Travis Hoium (Microsoft): Microsoft doesn't have the longest dividend history on the market, but it does have the advantage of being one of the biggest, most powerful tech companies in the world. It has made a successful transition from a PC operating system company to a giant in cloud and business services. Most important for dividend investors, Microsoft's free cash flow is staggering. 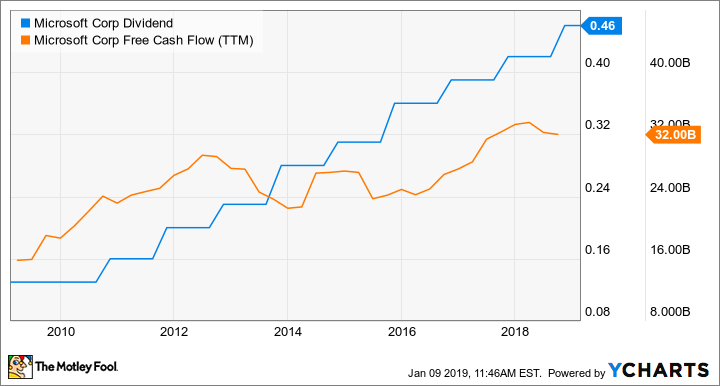 Over the past year, it has generated $32 billion in free cash flow, which is after billions of dollars invested in building out its cloud infrastructure that's currently driving long-term growth. Long term, I think Microsoft has been able to make a successful transition from PCs to a cloud-based business. It's now able to leverage scale in the cloud to compete with companies like Google, Amazon, and Oracle, an oligopoly that will likely keep smaller new entrants from gaining a hold on the market. And the cloud is set to grow further, as we have more connected devices and internet connections are getting faster. It makes sense to move computing power to server farms to increase utilization and optimize processing speed. Being one of the giants in tech is a powerful place, and Microsoft shows no sign of giving up its place in the market. Given how long Microsoft has been at the top of the tech world, this is a company that I think will be paying dividends for decades to come, making it my favorite Dividend Aristocrat with a 1.8% yield today.